Last week Blue21 was part of a delegation of the Seasteading Institute that went on a very promising exploratory mission in French Polynesia. The delegation was honoured to meet with President Édouard Fritch, a large part of his government and the mayors of Bora Bora and Makemo to discuss the development of sustainable floating islands. “It would be wonderful if we could work with The Seasteading Institute to bring sustainable development and economic activity to French Polynesia,” the President told us through our translator. “Let’s create the future together,” he concluded. The Seasteading Institute will send a draft Memorandum of Understanding to the presidency this week. 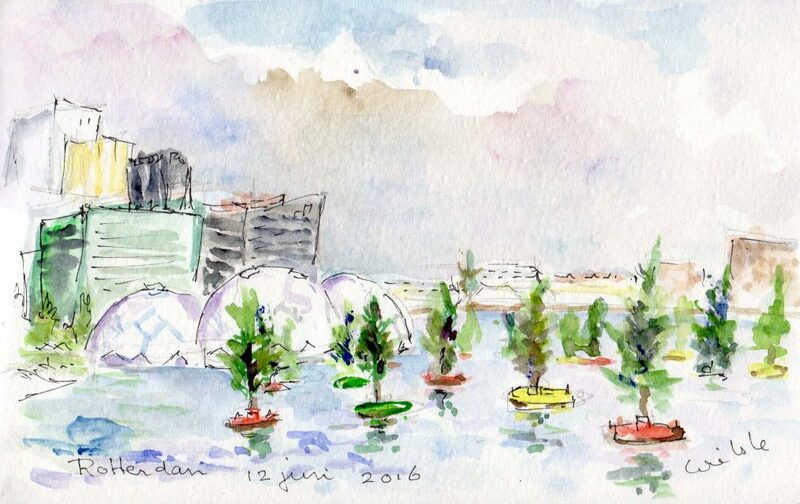 Cartoonist and politician Wietske Jonker-ter Veld recently made these beautiful watercolors of the Floating Pavilion and the floating forest in the Rijnhaven. 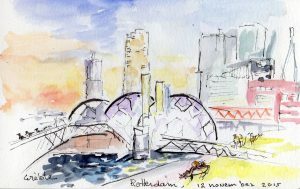 She was visiting Rotterdam with a grandchild from her village to show her the city and was positively surprised by this sight. Jonker-ter Veld is passionate about water and nature since she was a little child and has ever since been very active in politics and environmental issues. Thank you Wietske for offering us a new perspective! 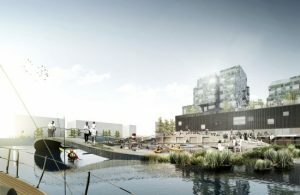 The capital of Denmark will soon get a new multi-purpose waterfront development. 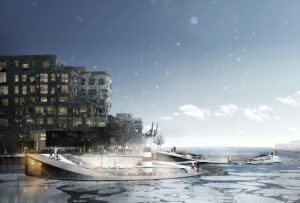 The Scandinavian architecture firm, C. F. Møller Landscape, won the “Nordhavn Islands” international competition to design part of the waterfront in the Nordhavn district, a harbor area in Copenhagen. 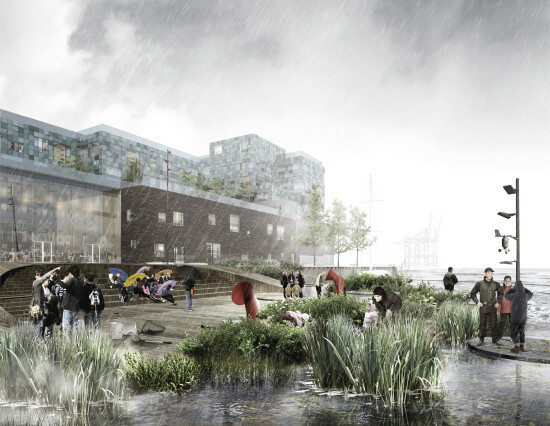 It will be “an innovative learning, activity and water landscape” adjacent to a planned international school which C. F. Møller is also designing. Three floating classrooms would give students opportunities to learn outside, even fish and kayak. The design blends a range of concepts – the urban park, the educational classroom, and the recreational community center – right on the waterfront. Could you live 100% sustainably off the water? If so, then a Major Television Production Company is looking for you! Do you have the skill sets and knowledge of what it would take to live 100% sustainably off the water? Are you interested in actually trying to do so for an extended period of time? If so, we want to hear from you! A Major Television Production Company is searching for people who want to live 100% off of the ocean. They want to find people who are PASSIONATE about developing new ways for mankind to sustainably live off of the ocean long term. For more information about the project and to speak with the casting producer, please email [email protected] with your contact information, a photo and a brief description of yourself. Die Welt wrote the article ‘Neue Heimat Wasser’ on how The Netherlands is threatened by climate change, since large areas will become submerged when sea levels rise. 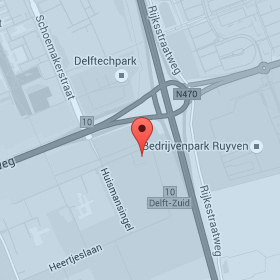 A very interesting read (in German) on how researchers and entrepreneurs are working on solutions, including interviews with Blue21, the city of Rotterdam, Aquadock and DuraVermeer.